I never agreed with Dr. Duke's views on Israel. Where do the members of the far left on this board come down on this issue? And do you realize that you're on the same side as David Duke? Strange bedfellows indeed. David Duke has admitted liking pizza. As do I. Which one of us has to give up liking pizza, and why? 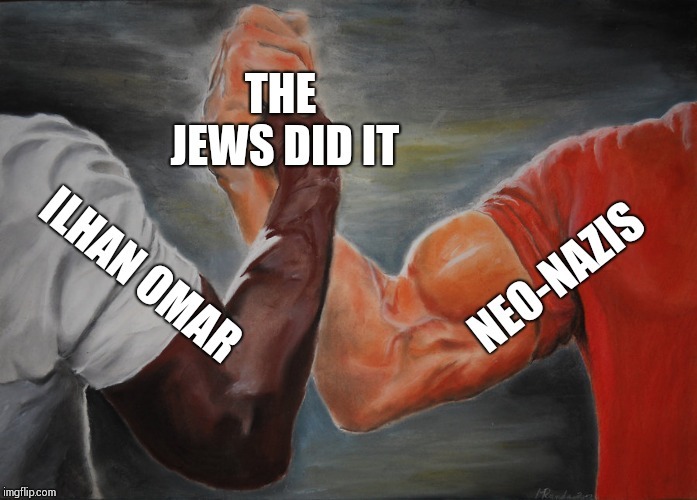 So canpakes, Ilahn Omar (D), and David Duke are all in agreement on this particular issue. David Duke doesn't have to be wrong about everything, right? It would be hard for any person to be wrong about everything. But the issue is more complex that pointing out that ‘neither likes AIPAC’. Do you agree with that, or do you only seek validation for Duke based on an assumption about what ‘all liberals’ supposedly believe because of an opinion by Omar? This gets at something I find deeply problematic in American politics - the view that it's a My Team v. Your Team arrangement where there are two sides locked in a zero sum game. This leads to all sorts of problems. As to the OP, Democrats have been coming out publicly condemning her statements. Perhaps that is the take away you should grab onto, Ajax. Having principles, and letting them trump partisan politics, is a good first step in having a functioning democractic society. The world is always full of the sound of waves..but who knows the heart of the sea, a hundred feet down? Who knows it's depth? Do you you share this attitude toward the Russia investigation? Faith is the only way we're going to make it. None of us are smart enough to do it on our own. ... Having principles, and letting them trump partisan politics, is a good first step in having a functioning democratic society. I certainly do. It would be great to hear more Republicans in congress disowning the Trump nonsense about (Republican) Robert Mueller's sober and methodical enquiry being a 'witch-hunt', don't you think? whichever one of you equates that liking pizza with hating jewish people. You need to rethink whatever you think you’re saying, lol. So Markk is Chap correct that Robert Mueller is a republican, and also who started this investigation? Your response is the exact thing in which Horonentheos was getting at. I just don't think what he suggested is possible in today's atmosphere. He's trying to say that he believes Pizzagate and holocaust denial. 95% of the posters on this forum are ready to hang Trump as a spy for Russia, without any real proof. This whole thing is being feed by the left. The Russian election meddling operation was a sophisticated attack against the West. This operation was funded through Russian fronts, including a catering company run by a close friend of Putin, Yevgeny Prigozhin. They used stolen American identities. Operatives bought political ads on social media sites. Operatives visited the United States, traveled across 9 states and discussed escape routes if they were caught inside the country. Operatives bought equipment including burner phones and SIM cards. The operation included hundreds of employees and millions of dollars. Prigozhin funded the Internet Research Agency and their meddling of the American election. This was a sophisticated operation that spanned over several years. Prigozhin has been Putin's go to guy for under the table missions including recruiting mercenaries for the conflicts in Ukraine and Syria. Russia is playing for keeps. Wake up, Republicans. 95% of the posters on this forum are ready to hang Trump as a spy for Russia, without any real proof. Er, no. 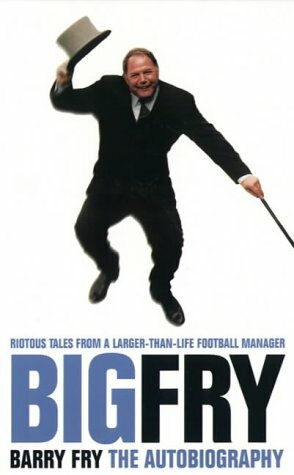 You exaggerate more than a little here. By doing that, you make a reasonable discussion difficult to hold. And you're the guy that thinks there is an 'atmosphere' around in politics nowadays? This whole thing is being feed by the left. Of course. Mueller (a Republican) is clearly a left-wing mole. So are the grand juries that have handed down indictments during this investigation, and the judges that have heard the cases and sent people to jail as a result. Really You cannot figure out the and? If Mueller is a republican in charge of this investigation and he was given this responsibility by republicans why should we think they are unfairly going after Trump? Not just the left, but also by intelligence services who are generally considered more conservative then liberal. I would note democrats haven't yet tried to impeach Trump and seem to be waiting for the investigation to complete. They have been starting their own investigations now they have the power to do so, but why not. There is a lot of smoke. The one thing about this Mueller investigation is that it is not yet complete and is getting a lot of indictments and guilty pleas. I suspect if nothing bad was going on we wouldn't see any of that. It’s kind of weird that something so trivial and silly would be the catalyst that made me realize the extent of the Russian operation; but, when I found a reference to this float buried in one of Mueller’s first indictments against Russian operatives, it was a “whoa-Nelly” moment for me. 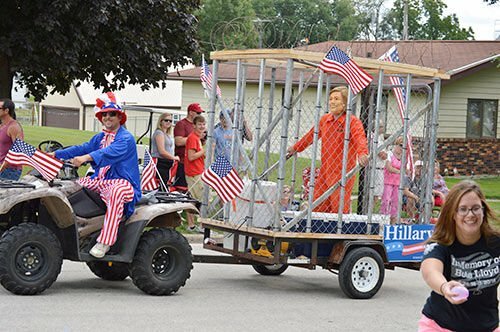 The Russians wanted the cage on a flatbed, so it could be paraded at rallies in Florida. But by the time the trolls were reaching into their bank account, three Iowans had already rolled out a smaller version of the cage float at a July 30 parade celebrating the 100th anniversary of the city of Arcadia’s fire department. Julin and his friends even came up with a gimmick the Russians don’t appear to have thought of: they passed out water balloons for parade-goers to throw at the caged Clinton impersonator. The Times Herald described a “young blond boy, no more than 8 years old,” having the “prideful smile of a job well done” after throwing a water balloon at the cage. We. Are. In. A. ____. Simulation.